The Biology of the Lion King: The biggest tragedy. Will soon meet their doom. Many evolutionary adaptations have allowed cheetahs to reach such unbelievable speeds. For one, their hearts and lungs are enlarged in order to circulate oxygen efficiently. Respiratory rates can increase from 60 to 120 breathes per minute when the cheetah hits full speed during a pursuit. Sadly, none of these adaptations will allow cheetahs to evade their impending doom. After surviving mass extinction 10000 years ago during the last ice age, humans have finally done the inevitable--the cheetah is now a permanent fixture on the endangered species list. With 10000 cheetahs remaining in Africa's wild, scientists predict that without efficient, targeted action, the cheetah could be extinct by the year 2030. As in 17 years from now. As in within our lifetime. The Cheetah Conservation Fund hopes to increase the cheetah's range by creating corridors that allow them to roam freely. There has been discussion of reintroducing cheetahs to former range countries such as India. 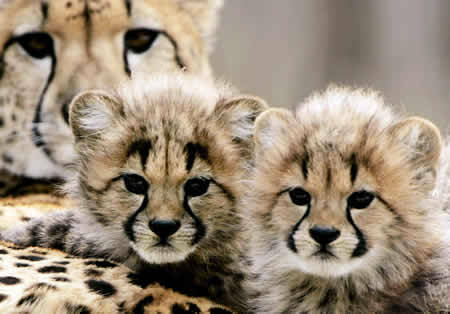 Check out the Cheetah Conservation Fund's website to learn about more ways to help save the cheetah: http://www.cheetah.org/ ! Look at those cute faces. They may soon become a thing of the past.